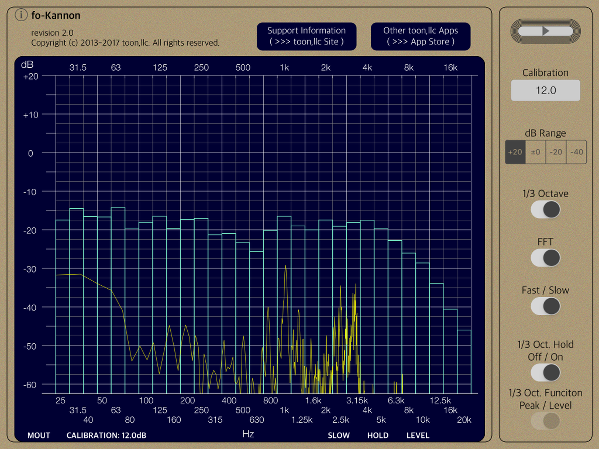 toon|fo-Kannon Audio Frequency Analyzer RTA Support - toon,llc. 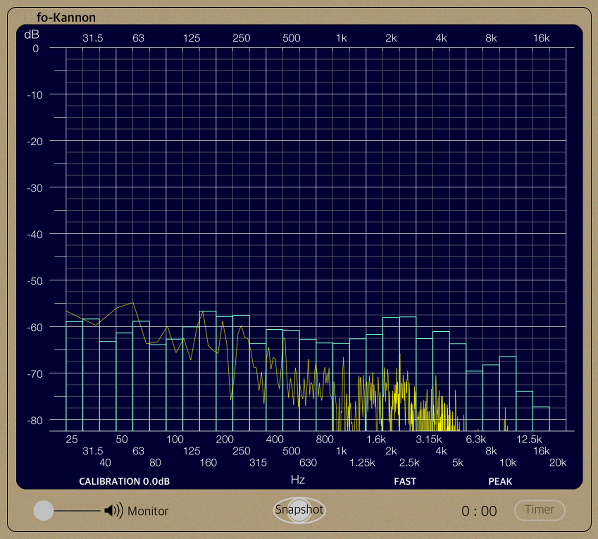 "fo-Kannon" is a powerful Real-time Audio Analyzer (RTA) app for iPad. It uses our proprietary digital signal processing technology to analyze incoming audio signals and provides a precision frequency response measurement and spectral visualization. 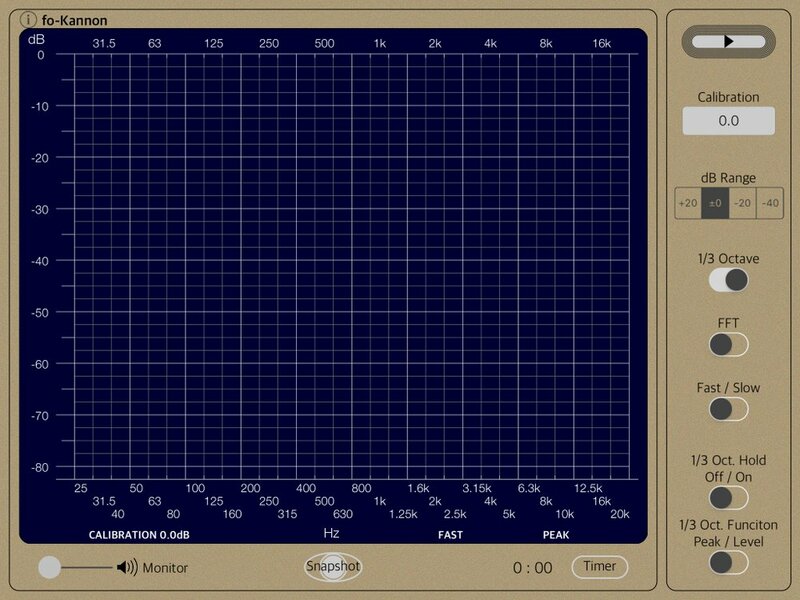 "fo-Kannon" is available in a variety of applications, such as room tuning, speaker test, audio equipment test, stage setting measurement and evaluation of sound mixing environment. Please to click the following link to download "fo-Kannon" from App StoreTM. It will be open the download page on App StoreTM. iPad, AirPlay is a trademark of Apple Inc., registered in the U.S. and other countries. App Store is a service mark of Apple Inc. Recommendation : Compatible with iPad, Requires iOS 11.2 or later. 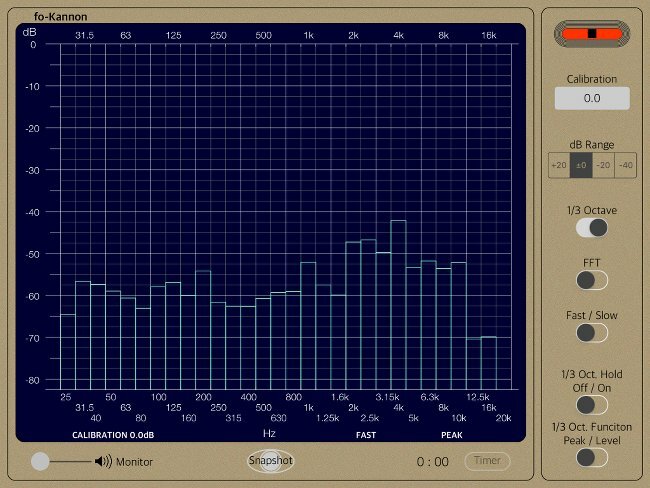 "fo-Kannon" measures the input acoustic signals, and displays the frequency spectrum in 30 split bands of 1/3 Octave or the logarithmic FFT scale. Timer function (TIMER) : up to 5 min. If you play back the pink noise sound from the audio system, it measures the characteristic frequency spectrum by setting of LEVEL and HOLD in the 1/3 Octave mode. 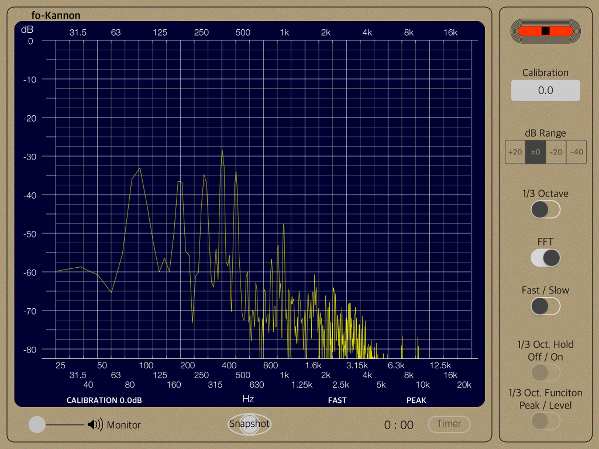 You can see the overall frequency response result of the audio playback environment. While feedback in realtime by using this result, you can easily improve the sound quality of your audio environment. At the time of starting the app "fo-Kannon", the topview will be displayed. All operations of "fo-Kannon" can be carried out in the topview screen. The access permission to the microphone will be confirmed from the iOS system at the first boot-up. Please enable access to the microphone. The operation panel on the right shows "Start/Stop", "Calibration", "display range setting (dB RANGE)", "1/3 octave mode (1/3 OCTAVE)", "FFT mode (FFT)", "Trace speed (FAST/SLOW)", "trace hold setting (HOLD)", and "Peak/Level setting (PEAK/LEVEL)". There is "trace display (TRACE DISPLAY)" on the upper left side, and there are "input signal monitor (MONITOR)", "trace capture (SNAPSHOT)" and "timer setting (TIMER)" in the left lower panel. "START/STOP" controls to operate the spectrum measurement of "fo-Kannon". Measurement is started by tapping "START" button. Tap again to stop the measurement and the trace display is retained at this time. "TRACE DISPLAY" is the image monitor that displays the frequency spectrum measurements. The display shows the amplitude and the voltage on the Y-axis, and the frequency of the 1/3 octave bands each on the X-axis. In addition, at the bottom of the display frequency of the X-axis, it will be displayed the current configuration. "CALIBRATION" is a function to calibrate the measurement gain. 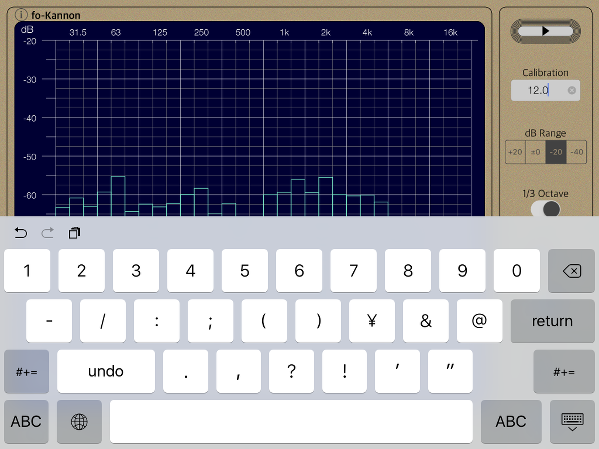 By tapping the calibration window, the input keyboard is displayed. You can enter a correction value is set in the range from -20.0dB to +20.0dB by the keyboard. "dB RANGE" is the setting of the display range. By tapping one "dB RANGE" button, you can select the display range. 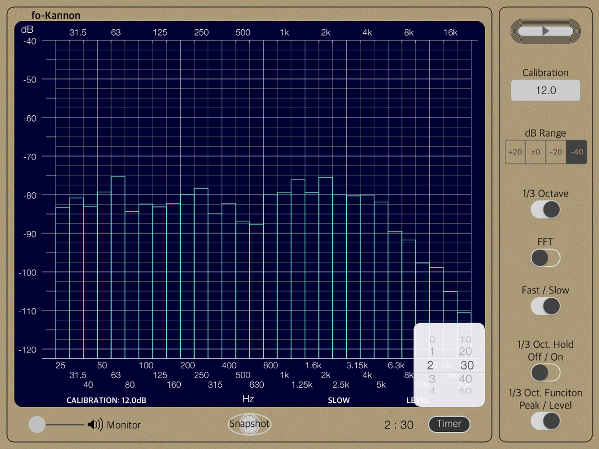 "TRACE DISPLAY" is visible in the amplitude range of 80dB. 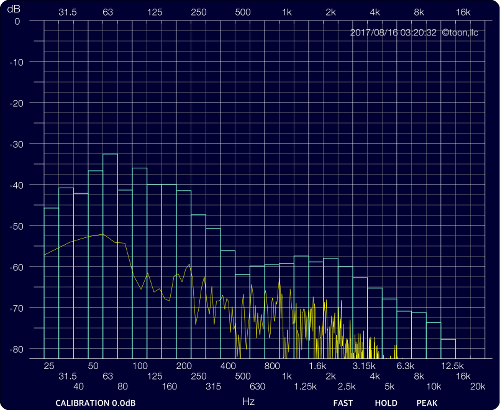 By "dB RANGE" setting, you can be observed in the amplitude display area that is shifted to -40dB from +20 dB at increments of 20dB. The default is set to 0dB. It can select from two measurement mode of "1/3 Octave" band response or the "FFT" scale. The default is set to "1/3 Octave" mode. By selecting both modes, it allows two measurements overlap display. Please specify the sweep time to match the characteristics of the acoustic signal to be observed. "FAST/SLOW" is a trace interval switching function of "TRACE DISPLAY". You can set "FAST" or "SLOW". The default setting is "FAST". "HOLD" is the setting of the trace display function in 1/3 Octave mode. "HOLD" is the function to continue to retain the maximum value of each frequency band (Max HOLD). 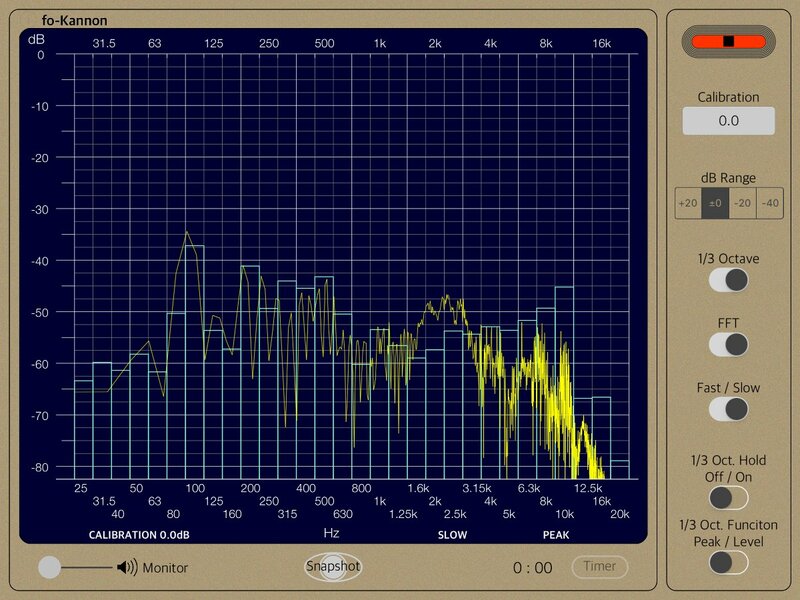 When you enable "HOLD (HOLD ON)", it is possible to observe a maximum cumulative value of the spectrum of the acoustic signal over a long period of time. The default is to disabled (HOLD OFF). "PEAK/LEVEL" can select the trace method of either the average power level (LEVEL) or peak level (PEAK). Please set "LEVEL" if you want to observe in the average power level, or set "PEAK" if you want to observe the peak instantaneous value. The default is set to "PEAK". 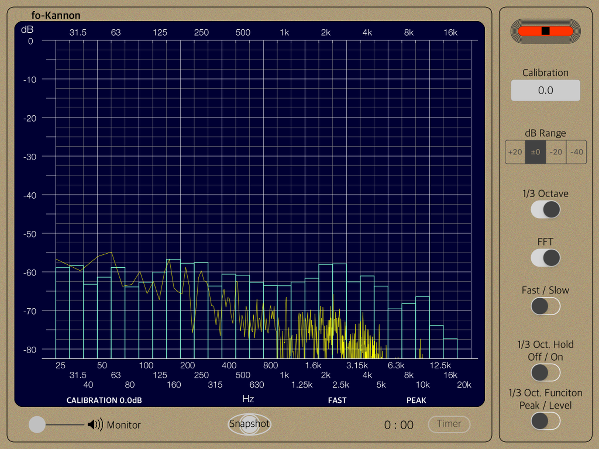 "MONITOR" is a function to monitor the microphone input signal. You can control the output volume level for monitoring. In addition, there is a delay time for the monitoring output. It has a possibility that the howling noises will be occurred if you use the built-in speaker. So please carefully adjust the monitor volume level. We are recommended that you will connect to external headphones. "SNAPSHOT" is a function of capturing a still image for "TRACE DISPLAY" being currently measured. By tapping "SNAPSHOT" button, the image will be saved PNG file format to Photos. File name is "IMG_xxxx.png". In addition, when you press "SNAPSHOT" button at the first time, the confirmation of access to Photos will be required once from iOS system. "TIMER" is a timer measurement function, and you can set the timer time up to 5 minutes. When you tap "START" button, measurement starts, the measurement stops automatically by a timer setting value. Timer function is useful when you want to measure and evaluate multiple times with the same set time. By tapping the "i" button, it will be displayed on the product information. It is returned by tapping the "i" button again. By tapping "Support & Information", "Safari" will be started and you can view our support page. "fo-Kannon" version 2.1 was released on March 23, 2018 UTC. * Requires iOS 11.2 or later. "fo-Kannon" version 2.0 was released on August 15, 2017 UTC. * Requires iOS 10.3 or later. "fo-Kannon" version 1.5 was released on July 26, 2016 UTC. "fo-Kannon" version 1.4 was released on April 7, 2015 UTC. "fo-Kannon" version 1.3.1 was released on July 4, 2014 UTC. "fo-Kannon" version 1.3 was released on June 29, 2014 UTC. "fo-Kannon" version 1.2 was released on April 2, 2014 UTC. "fo-Kannon" version 1.1 was released on November 27, 2013 UTC. "fo-Kannon" version 1.0.0 was released on July 25, 2013 UTC. If you use an external digital audio interface via DOCK/Lightning or USB interface, iOS device is input from the left channel. Please input of the accoustic signal out of the way to level-over by the gain adjustment carefully. The external microphone input of iOS devices (via pin jack) is easy to noise contamination from the wireless system. It is recommended to use in Airplane Mode. When the acoustic signal of high level is input from external microphone (via pin jack), iOS devices might be switched to the built-in microphone automatically. It is recommended that you should adjust the microphone gain very carefully. At the time of the first access to microphone and photos after installing the app, you will be asked permission to access them from the iOS. If you did not enable this setting on this time, it can not be access from the app by privacy restrictions of the iOS. Please enable slide switch of the app in the access permission of the iOS setting, "Settings > Privacy > Photos or Microphone". We have posted frequently asked questions (FAQ) from our customers. Please check before making inquiries.